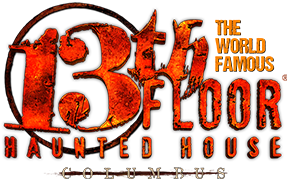 13th Floor Haunted House Columbus is a Haunted Attraction located in Columbus, OH. Team Mysterious Misery reviewed this Haunted Attraction on October 19, 2018. 13th Floor Entertainment has 15 haunts in 11 cities and have officially added Columbus, Ohio to their list or places to raise Hell. This is their first year in their location at 2605 Northland Plaza Drive and they came ready. Ran by Ashley and Harry and their frightfully-well-put-together team, they provide entertainment for hours. Being one of the few haunts in the heart of Central Ohio, it is easy to see they will quickly become a favorite of patrons. This is a large haunt, so it requires an amazing team to keep it running and operational each night. This is one of the few haunts that is one hundred percent fully paid. This cast isn’t doing it for volunteer; they are out to scare you like their paychecks depend on it. For this haunt, they need at least 90 actors for the inside of the haunt to run at capacity. This does not include all the extra staff that are around and helping make the night go smooth. The cast inside the haunt may be large, but they do extremely well. Some have been in the business for years and know what it takes to get adequate scares from everyone in the group. The cast is large, so there are enough of them in the haunt and create very few dead spaces. However, you may run right by them and not notice they are there because they do so well hiding. The cast will be very interactive with you, especially if you become a part of their scene. Some do very well at dialogue with you while others stick to a script. You will encounter many different creatures as you make your way through the haunt. Even though there are many kinds that you will face, none of them will be out of place. It is easy to see this large group of horde actors are giving you their best. 13th Floor is not your local backyard haunt in this area. Having so many haunts and experience in costuming for many years; it shows. If you have time to look, the details in some of the characters are amazing. They have airbrush makeup artists on hand who can create custom creatures for each scene. Masks are very limited in this haunt. When you do come across them, they are well fitting, unique and help the characters fit into the scene. Another bonus is they have a wardrobe manager for this haunt. This is to help the cast be a complete look from head to toe. The use of the wardrobe manager and the makeup person help them morph into full-blown characters who complete scenes. One of the things we noticed when we pulled up is the ample amount of free parking in a well-lit parking lot. We then noticed the Lyft pick up and drop off area and thought this was a cool added touch for those that are using that service. The ticket ladies were very helpful in explaining the options of tickets and pricing. We had the benefit of meeting Ashley, who is the GM, and Harry, who is the operations manager. They both were very eager in telling us about the haunt. We felt safe, as there is security, and everyone gets a wand-down; CPD is on the scene to keep the crowd under control. On the night we attended a patron had messed up some cameras, but it was not a big deal to this haunt. They had plans in place and executed those plans to keep the night going. When you stand in the first line, you get a mixed bag of stuff. There are creatures roaming around and there is also music playing around. If you are lucky, like we were, you will see the creatures do the wobble. It seems to be a very light hearted and fun area. After you are allowed in, you will be guided to a dark room with moss hanging from the ceiling and creepy music playing in the background. There are giant posters with warnings and rules for the haunt. While in the new queue line, they run movie trivia and promos on TV screens. When you get to the front of the line, you will see the facade of what looks like a cabin as the entrance of the haunt. Look to the right and you will see one of the coolest pumpkin kings ever. This is the moment when the uneasiness sets up and the anticipation builds. Running a 40,000 square foot haunt gives you the opportunity to add some amazing special effects, just like the 13th Floor Haunted House Columbus does. One thing that comes to mind for this haunt is the word massive. Much of what they do is on a large scale, which creates the illusion that you are small. They have giant “puppets” that will send those who are faint at heart running. They, like many other haunts, have a laser swamp this year. Keeping with their large theme, their laser swamp is a little higher than most make the average 5’4” person feel like they are drowning. If you are a haunt enthusiast, you have probably seen vortex tunnels, but none like this. To make this one better, not only is it a vortex tunnel, but let’s add black-light paint, 3-D glasses and a creepy-a$$ creature at the end. It is enough to make the strongest go down, get dizzy or may even vomit. One prop that caught my attention that I thought was fascinating was a large bloody wall with body parts in it; it was so realistic. Extremely large Venus Fly Traps want you to feed them throughout your journey. One of the more entertaining parts of the haunt is the 3D-painted, black light area. It puts your senses into overload. Some of the special effects come from well-designed scenes that fully immerse you in the story with exactly the right type and sound to make it believable. 13th Floor is like an onion; as you peel back each layer, you get something new while you cry the whole time. It is one of those haunts that will not only scare, but provide a night of entertainment as well. The special effects will keep you on your toes guessing what is real and what is not. Drop doors allow the cast to keep scaring the crap out of your multiple times in an area. The music is always just the right volume to scare you or temporarily deafen you as a distraction. The cast does a great job at distracting you too, so you probably won’t see the additional scares coming your way. One thing our group enjoyed was some of the very realistic things in this haunt, like the actual emergency sound we heard. There’s nothing like that sound to freeze you and let panic set in. We were not only frightened, but we were entertained through this haunt as well. Some of the clowns love their jobs and bring a smile to your face as you see someone run by your in terror. Another thing to be mindful of is that you can bottleneck easy and this will take away from the scares. 13th floor tries to address this by, in the middle of the haunt, making you stop and retiming you back out for the second half. General Admission ranges from $19.99, $24.99, $27.99 and 29.99. Your walk-through time will depend on if you run through because you are completely terrified, if your group gets held up, and many other things. 13th Floor also offers some pricier ticket options for those who are not patient to wait. However, with these prices you are not getting the most bang for your buck; you are getting convenience. They have six 5-minute escape rooms that can keep you busy. You can pick one or two or all 6. Each escape room is $5.00 per a room per a person. However, you can do all six for $25 per a person. They offer them at different levels of difficulty. How good are you at getting out? They also have a carnival game called Zombie Brain toss. $3.00 will get you 5 brains. You must get the brains into the animatronic zombies. 3 brains get you a small creepy plushie and 5 gets you a bigger creepier plushy. I am sure your date wants you to win them something they have seen come to life in a horror film; I know I would. There are plenty of concessions, items to purchase and don’t forget the photo op so you have a last memory of the nightmare you just experienced.